Plug into a Guitar Tube Marker and you won’t want to put your guitar down. It gives you a rich, natural tube amp-like distortion that is touch-sensitive and preserves your guitar’s tone and note definition. Use it to drive a tube amp to the edge of distortion, or run it into a clean channel and let the pedal do the work. It has plenty of drive so you can dial in anything from a subtle OD to a saturated tube OD. It has plenty of level to overdrive a tame tube amp. True bypass switching. Like all our products, the DV Mark Guitar Tube Marker is manufactured using the highest quality components to give you years of great tone! Mixdown Magazine (Australia) reviews the Guitar Tube Marker pedal Jan. 26, 2011, 11:41 p.m.
"Any guitar sounds good (and natural) through this unit... This is a great TS-on-steroids pedal with a tone that you'll keep coming back to." 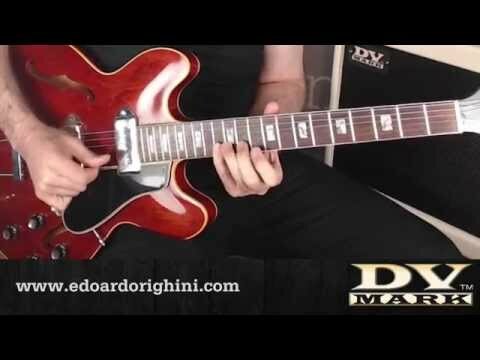 DV Mark artist Edoardo Righini plays through his DV JAZZ 12 combo and Guitar Tube Marker.